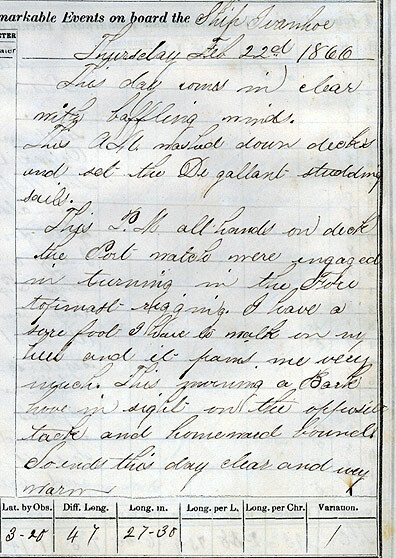 Feb. 22: "I have a sore foot, I have to walk on my heel and it pains me very much." Feb. 23: "About five bells it commenced to rain and raind (sic) pretty hard for two or three hours, we caught quite a lot of water. At four bells my foot paind me so that I had to go below, I did not go on deck last night." Navigating by applying courses and distances made through the water from the last known observed position. The term dead could be a form of "ded" from "deduced" reckoning.. Mr. Brown took an observaton tonight which gives us twenty one miles north of the equator." Feb. 25: "Mr. Harriman lanced my foot, it discharged quite a lot of matter. At noon by observation we are ten miles south of the line; Mrs. Harriman lanced my foot again but it does not ease it any." Feb. 27: "I have been at work today but it pains me to stand on my foot."